But, whitetails are not the only animal species to photograph in Cades Cove. Although typically inactive, black bears are often spotted and successfully photographed during this time of year. The most common times of days to locate these elusive animals are sunrise and just after sunset. Lighting conditions are not always ideal so a fast lense is often a requirement. 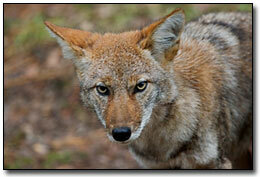 Recent years in Cades Cove have seen a significant increase in coyote populations. Chances of sighting a coyote are high. Most are in excellent physical shape and have nearly perfect coats. However, coyotes shy from foot travel, making them best photographed from a vehicle. Cades Cove also enjoys a large population of Pileated Woodpeckers. These are often seen, but difficult to photograph. Early afternoons in open timber are your best chance to photograph them. It is also common to locate bluebirds, eastern turkeys, barn swallows, crows, and harriers. Less commonly found animals include the red fox, ruffed grouse and otter. Early mornings and late evenings are also the best chance to spot an owl. Recent introduction of Elk to the Cataloochee area in the Eastern area of the park may prove worthwhile to some. Even though wildlife is accustomed to human presence, these animals are still very wild. If you observe your subject walk away from you, begin feeding the other way, walking directly towards you, or in some cases even taking notice of your presence, you may be to close for their comfort. Slowly backing away from the animal can help ensure your safety and the comfort level of the animal. Approaching to closely, or not heeding warning signs animals give can and will cause negative encounters with animals, possibly resulting in injury to you. Heeding these simple warnings will ensure a successful photography trip. Not surprisingly, wildlife is not the only subject of interest during winter in the Smokies. Dramatic landscapes occur in the Smoky Mountains all times of the year. Winter clouds create dramatic landscapes. At times, clouds seem to rise out of the valleys. Silhouettes of barren trees against winterly skies can create appealing images. And changing weather patterns can bring almost theatrical sunrises and sunsets. 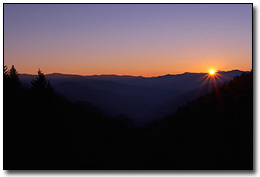 Sunrises are best viewed from the Foothills Parkway just west of Townsend and from the Oconaluftee Valley overlook on Newfound Gap road. 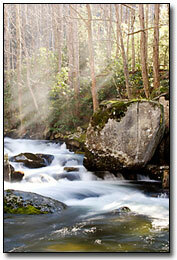 Often, photographers entirely dismiss the abounding streams of the Smokies during the winter months. However, excellent reflections occur during the early portion of the winter due to newly fallen leaves and their golden cast. You will also find streaming sunlight through barren trees striking rising mist rising from rapids. Areas that have sunlit stream banks and streams within shadows are the areas to concentrate on. The Smoky Mountains has a magical touch that will stay with you for the rest of your life. While there you will no doubt have time to reflect on our Creator and the glories of nature. It's no wonder that this mystical place is the most visited national park in our country and once you to visit the wonder that is "The Smokies", you to will yearn to return as I do.